You can find labels for the Zebra ZM400 printer here. Looking for thermal transfer ribbons for your Zebra ZM400 industrial label printer - FeedYourZebra supplies only genuine Zebra thermal transfer ribbons for the Zebra ZM400 printer, helping you achieve the best print results possible. All of our Zebra ribbons come with free delivery. Zebra ZM400 thermal transfer ribbons are designed specifically for use with Genuine Zebra labels in Zebra ZM400 printers. Zebra thermal transfer ribbons are available for Zebra ZM400 in the following formulations to perfectly match your label printing application. Zebra 2300 standard wax thermal transfer ribbons provide very good print quality on most uncoated and coated paper facestocks. It provides good print quality on normal and rotated barcodes at speeds of up to 254mm per second. Its low print energy requirements for image transfer and its superior backcoating make this a superb pure wax ribbon choice for all Zebra thermal transfer printers. You can find labels for the Zebra ZM400 printer here. 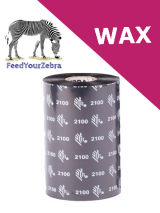 Zebra 2100 high performance wax thermal wax thermal transfer ribbons are resin enhance and offer superior abrasion resistance when compared to conventional was ribbon products. The Zebra 2100 thermal transfer ribbon provides excellent print quality on normal and rotated barcodes on coated and uncoated thermal transfer labels and tags, as well as many many synthetic label materials. You can find labels for the Zebra ZM400 printer here. 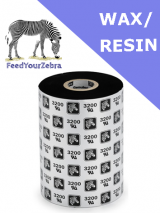 Zebra 3400 high performance wax / resin thermal transfer ribbon offers excellent print quality on a wide range of coated and uncoated paper labels and many matt synthetic labels materials. The ribbon excels when rotated barcodes are required. This high performance ribbon also provides good abrasion resistance and is competitively priced, offering an economical solution to many industrial and retail labelling applications. Suggested applications for the Zebra 3400 thermal transfer ribbons are shelf-edge label and tags, box and pallet labelling, inventory labels, labels exposed to steam, alkali or acid solutions and industrial labels with medium life expectancy. You can find labels for the Zebra ZM400 printer here. 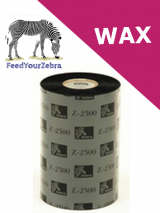 Zebra 3200 premium wax / resin thermal transfer ribbon is a special ink formulation for use with all Zebra thermal transfer printers. The Zebra 3200 thermal transfer ribbon provides outstanding print quality on a wide range of label materials and provides smear and scratch resistance on Zebra paper and synthetic label materials. In addition, it offers good resistance against many everyday chemicals resulting in staying power and durability in harsh environments. Suggested applications for Zebra 3200 thermal transfer ribbons are outdoor product labelling and retail shelf-edge labelling. You can find labels for the Zebra ZM400 printer here. Zebra 5095 high performance resin thermal transfer ribbons provide images resistant to most harsh environments (smearing, moisture, abrasion, extreme temperature and chemicals) when printed with our Zebra synthetic labels and tags. The low energy requirements for this ribbon will allow for excellent print quality even when very small fonts are required and high print speeds are possible. Suggested applications for Zebra 5095 thermal transfer ribbons are chemical container labelling, automotive labels, industrial rating plates. You can find labels for the Zebra ZM400 printer here. Zebra 4800 performance resin thermal transfer ribbons offer exceptional abrasion and solvent resistance on a wide variety of label materials, while still providing excellent edge definition. This ribbon is an excellent choice for printing dense barcodes and high resolution graphics. Its unique resin base provides excellent resistance to outdoor elements and many chemical solvents. Suggested applications for Zebra 4800 thermal transfer ribbons are steel mill labels, automotive labels, labels exposed to harsh outdoor environments. You can find labels for the Zebra ZM400 printer here.